After you sign in, transfer your share into your tote bag. Flatten the box the share comes in. It’s not that difficult if you take a moment to figure it out. Take a look at these step by step photo instructions. Here’s a video of the process. DO NOT RIP THE BOX! (They are expensive, and because they are waxed, can not be recycled.) 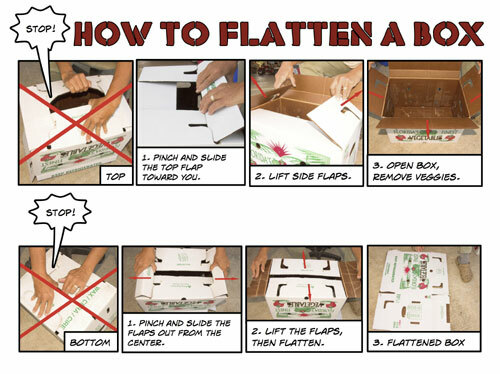 When the box is flattened, stack it in the designated area of the pickup site. If you take your share home with box, don’t forget to return it for the next week. The boxes are reused several times during the season. Don’t worry, you’ll figure out the box thing quickly enough. Enjoy the veggies!